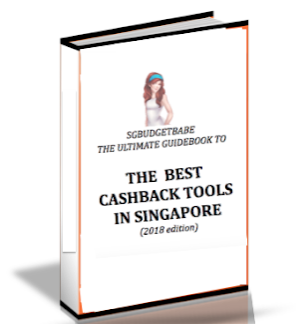 It is no secret that I prefer cashback over miles credit cards - after all, I've also written extensively on the topic in numerous articles before, including why I'm on team cashback, the best cashback cards to get for 2018, authored the Ultimate Guidebook to the Best Cashback Tools in Singapore, went on to develop (with a reader) the SGBB Cashback App to help folks like myself manage the different cashback credit cards in our wallets. I get cold, hard cash which I get to decide whether to save / spend / invest. My cash can be parked in my high-yield savings account for higher interest as well, therefore literally using my money to grow more money. Cash opens up a bigger world of opportunities for me to choose what I want to do with the money, in contrast to the limited options I get with miles redemptions (and I personally don't care much for luxurious travel experiences anyway). What I've also observed for some miles-chasers is that some are motivated to keep spending money just to reach their holiday goals of clocking up enough miles to redeem their free flights. This is a big no to me, because that's exactly what the banks and credit cards want you to do! Any freebie should be an incentive and not something you should have to work for. 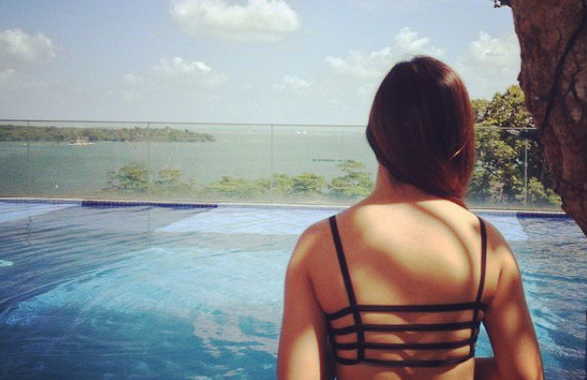 How much cashback do I earn in a year? I don't really spend much, but as it is, I already get paid $200 - $300 in cashback every year alone since I hopped onto the cashback credit card hacking game, which I find as pretty decent bonus money! Some cashback credit cards require minimum spending every month, which isn't too much of an issue to me either, because one trick I use is to always offer to pay the bill first and then let my friends pay me back after in cash. Most of the time, my friends are only happy to let me do that (I guess cos no one likes to take on the task of chasing for repayments haha). If you want a card that rewards you for travelling on public transport, this is a pretty decent card that gives you 2% for all your ez-link top-ups whereas most other cards exclude such transactions. It also gives 5% on dining (fast food and coffee) and movie entertainment purchases. For groceries, it gives 5% for your purchases at Fairprice, Sheng Siong and Giant (but this falls to 3% if your transaction is less than $50). The minimum spend on this card is also fairly low compared to most of its peers, at just $300 a month. 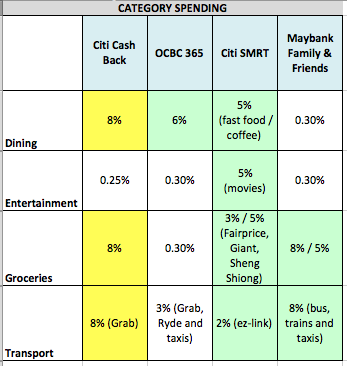 Another close contender would be that of Maybank Family & Friends, which gives an even better 8% on bus, train, taxis and groceries! The caveat is that it requires a minimum spend of $500 a month but it is really only good for maximising cashback in the transport, groceries and Watsons/Guardian/Unity categories, as the cashback rate of 0.3% for dining and entertainment is nothing much to rave about. Thus, since there's no way I can hit $500 every month on just those limited categories alone, I personally eliminated this card from my choices as it doesn't fit into my lifestyle. 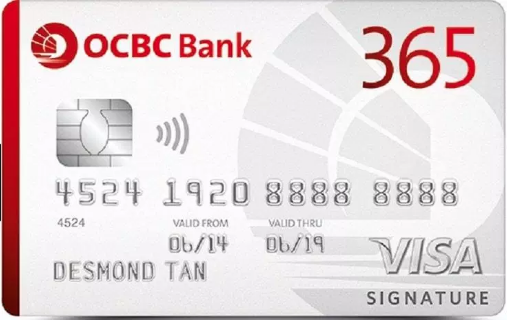 I still have my OCBC 360 savings account from when I first opened it years ago, so this card plays a dual role of giving me cashback and concurrently fulfilling the requirement for me to get bonus interest on my savings. At 6% for dining and 3% for Grab rides, this card has been my faithful companion across both categories and for my OTC medical spend for many years. However, their recent change has seen a revision of the monthly minimum spend go up from $600 to $800 a month, otherwise your cashback rate falls to a paltry 0.3%. I'm not entirely sure if I'll be able to consistently hit that high a spend and am still trying to see if I can shift some of my family's recurring bill payments over, so I'll be monitoring the situation before deciding whether to keep or terminate this card. You should probably do the same. Provided you can constantly spend $888 every month. At 8% for dining, groceries and Grab rides, this offers the best cashback across all three categories. It is overshadowed only by CIMB Visa Signature for 10% dining, and BOC Family Card for 10% dining and entertainment. 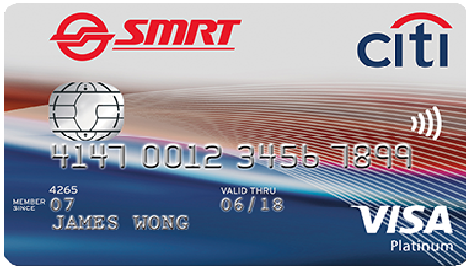 Also don't forget to claim your exclusive gifts of Grab codes or NTUC vouchers worth $200 if you're signing up for any Citi cards via SingSaver. How much cashback can I get? In deciding which cashback credit card to go for, it is imperative that you must find a card that fits into your lifestyle (instead of trying hard to fit your lifestyle around the card just to qualify for the rebates!). 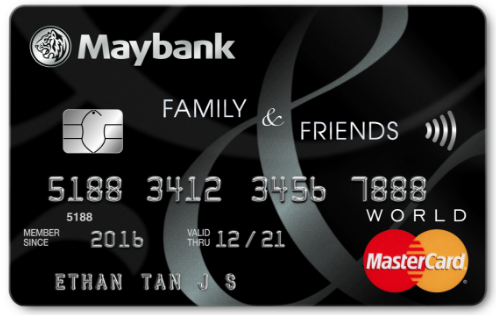 Since the minimum spend does not hit the (new) requirements for the first two cards, we'll look only at the last 2 cards, where Maybank Family & Friends comes in superior. However, you'll notice that most of the cashback is clocked up only on transport and groceries, and the $200 that you spend on dining is pretty much wasted as it could have yielded a higher cashback return elsewhere. 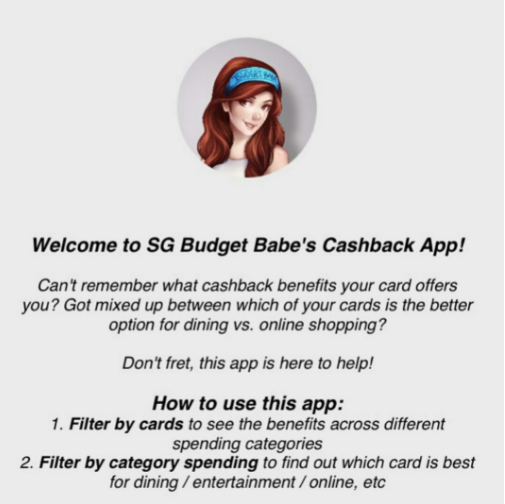 To avoid this, one hack would be to charge the $200 dining spend to the AMEX True Cashback Card and STILL be able to hit your minimum spending for Citi SMRT or Maybank Family & Friends Card. 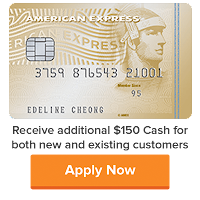 Plus, AMEX is giving away upsized cashback of 3% (instead of the usual 1.5%) for the first 6 months so this helps to earn you even more cashback! Thus, now the combination of Maybank Family & Friends + AMEX True Cashback Card proves superior, netting me $50 cashback per month in total for my existing spend. Combined with the $150 cash promotion right now, I'm effectively getting $450 cashback in total for the next 6 months alone! 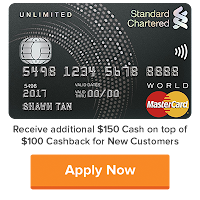 Alternatively, if you find it too much of a hassle to manage your different cashback cards and category spending, a great alternative I personally love would be in the SCB Unlimited Cashback Card or the AMEX True Cashback Card, which requires zero minimal spend and offers a flat 1.5% cashback across all categories. It is as fuss-free as it gets! I've also reviewed both cards previously in this post. 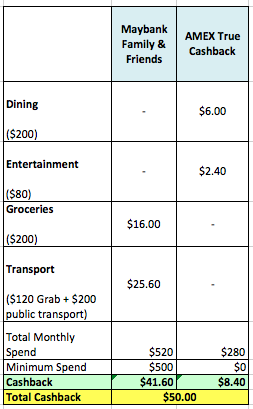 You can also get an additional $150 in cash if you're applying for the SCB Unlimited Cashback Card during this period! 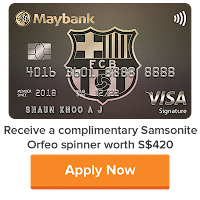 The only card better than both of them would be the Maybank FC Barcelona Visa Signature Card, which offers a marginal 0.1% more cashback for the same (lack of) requirements. My only concern is whether the latter is a promotional rate or will be here to stay for the long-term, in contrast to the former two which have been around for much longer and will probably not be slashed anytime. So what's the best cashback card right now? The simple answer is, it depends on YOU! 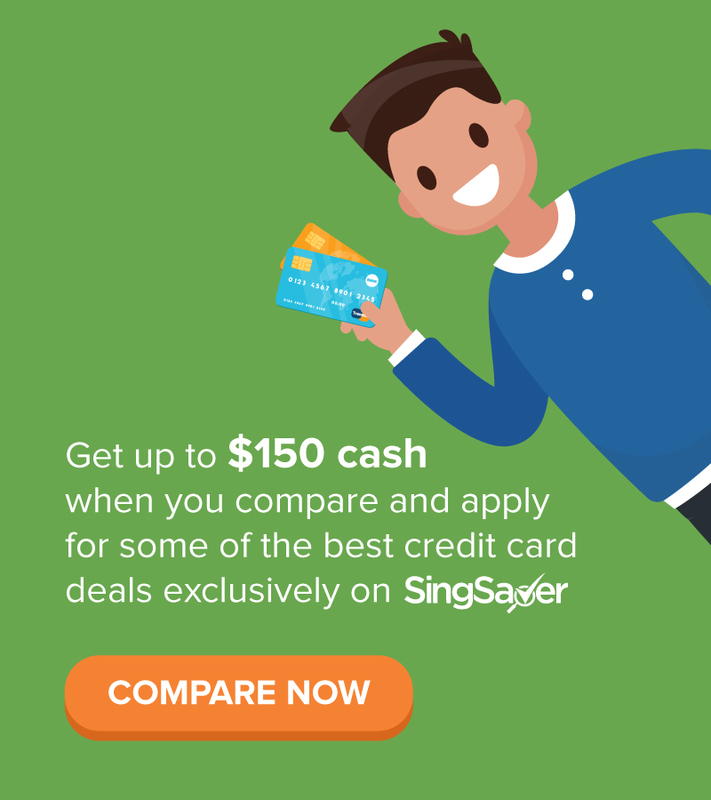 I usually compare against all the credit card promotions on SingSaver and apply for them there. In case you didn't know, the salespeople you see at roadshows trying to get you to sign a new credit card actually get a monetary commission for each successful sign-up, none of which goes to you (except for the bank's welcome gifts which they use to lure you into signing up). 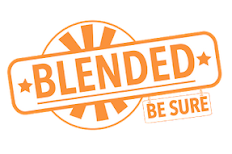 I opt to bypass that by going through SingSaver, where they split these commissions that the banks pay with us consumers together with various other bank welcome gifts and incentives. My previous experiences with them have been pretty good as I've received my vouchers from them, which is why I continue to urge my friends and readers to get through them as you get more benefits! Still too confusing? 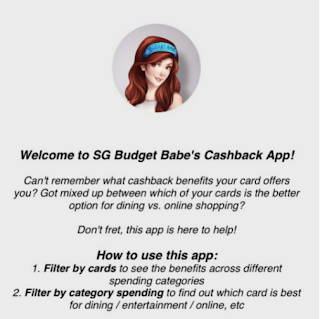 If you're like me, with multiple credit cards in your wallet which you can't remember which to swipe for the highest cashback in the respective category when you're out and about...try the SGBB Cashback App, which I developed with a reader to help overcome this problem for myself, and you guys too! :) You can download it on iTunes here and for Android here. Disclaimer: This post contains affiliate links if you'll like to get your card through SingSaver as well. All opinions are that of my own. For this post, I've personally selected the best cashback cards I feel are currently in the market for myself, and linked their respective affiliate links for you to make your own decision, especially if you have similar spending patterns as me. Your calculation for groceries on the OCBC 365 is wrong. The card does give a 3% cashback for groceries. Plus the occasional FairPrice promos of giving $3 Esso petrol vouchers (works out to around 21% rebate/cashback for me) for $60 grocery spend. And $3 Fairprice vouchers for $60 petrol spend. 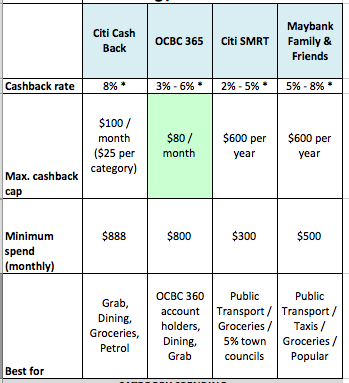 There's also the 3% cashback for recurring telco bills. 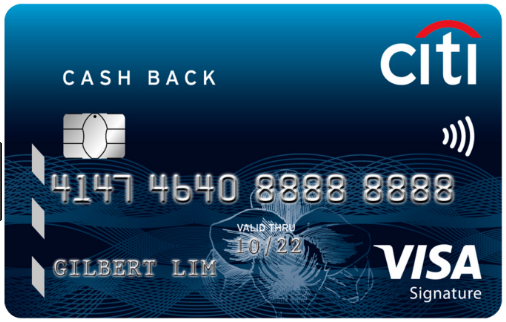 In general, I still think it's a well-rounded cashback card despite the increase in minimum spend. Oh yes you're right, thanks for correcting that! 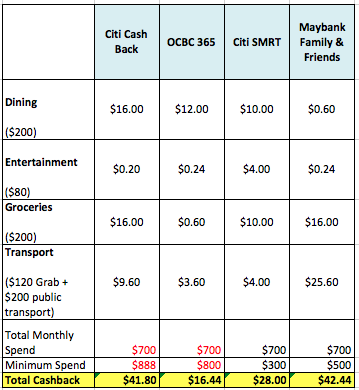 It should be $6 instead so OCBC 365 total cashback becomes $21.84 instead of $16.44! 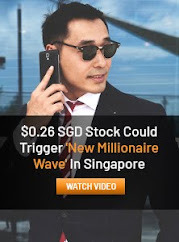 How about UOB One cash back?